This new Rumble59 bowling shirt takes you on a nostalgic journey back to the time of the legendary movie 'The Wanderers'. In Little Italy, Chubby Galassos bowling hall is open to everyone, unless professional gamblers are finding their way to the 'Paradise Lanes'. 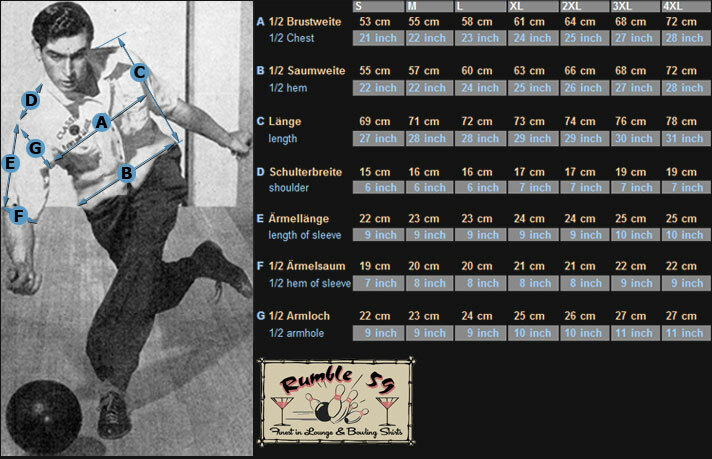 Then, Chubby and his Mafia mates will show those characters that throwing a bowling ball with broken fingers is rather difficult. 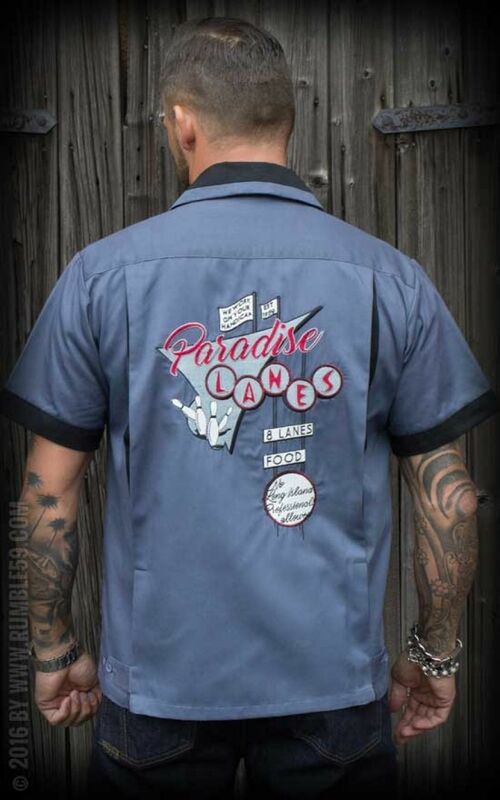 So, pay tribute to 'The Wanderers' and honor the 'Paradise Lane' ritual with this shirt of the same name. Experience like Joey, Richie and Perry the challenges and trials of New York in 1963: a sporty competition with the bolwing balls, chatting up girls, roughing up the 'Baldies' and braving the 'Ducky Boys'. This movie about the coming of age in a New York street gang in the 60s, with its tragic and sympathetic characters, has reached cult status since its relaese in 1979. 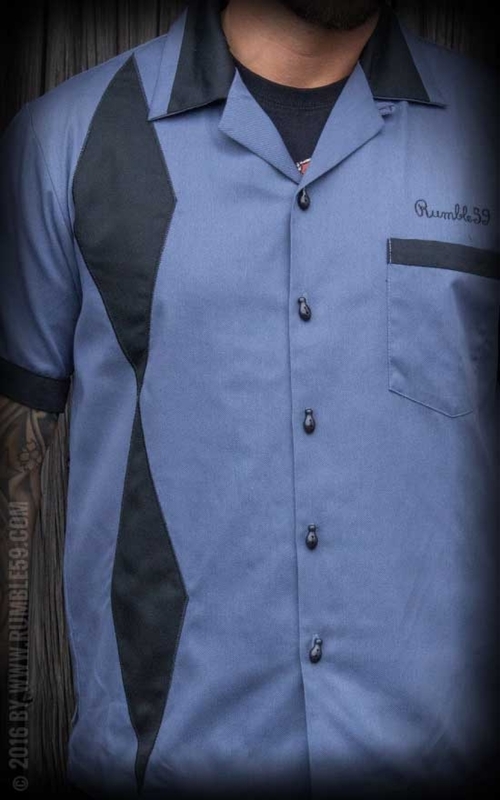 Inspired by the bowling shirts of the 50s, this Rumble59 shirt is true to the classic style a littler shorter and practical for throwing a bowl or just sipping a great cocktail. 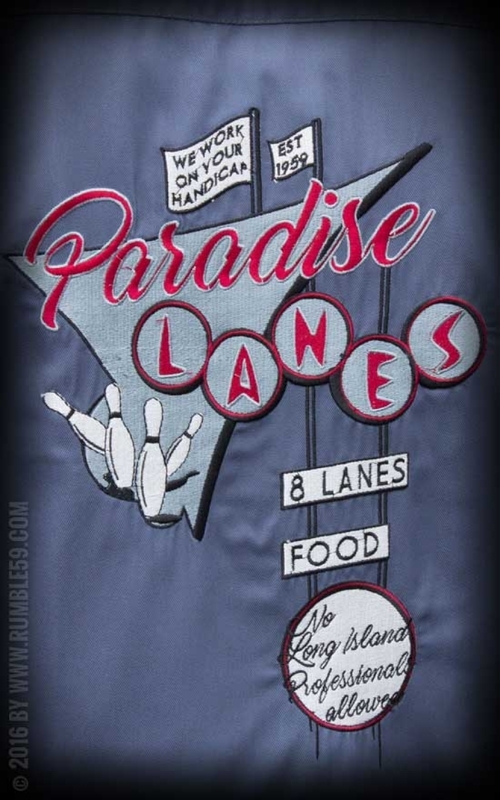 The 'Paradise Lanes' shirt design looks fantastic with its two contrasting colors: blue and black. The back panel features lavish embroidery, matching the small embroided logo detail at the front. The seams at the back feature adjustable straps for the perfect custom fit. The folds at the back panel in contrasting color guarantee ease of movement - not just at the bowling alley! The right front panel is decorated with a design of two black rhombs, and also the seams at the sleeves, the collar and the chest pocket are in matching black. 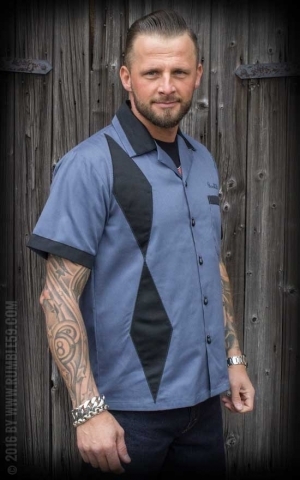 This retro shirt has short sleeves, a chest pocket on the left front panel and a yoke at the back. 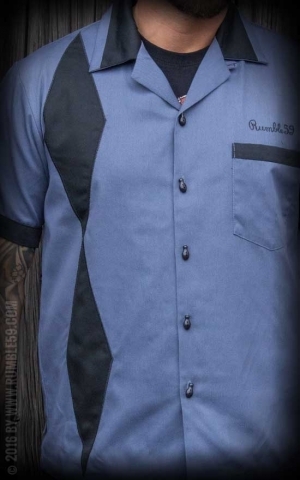 Button in bowling pin shape perfectly complement this shirt. 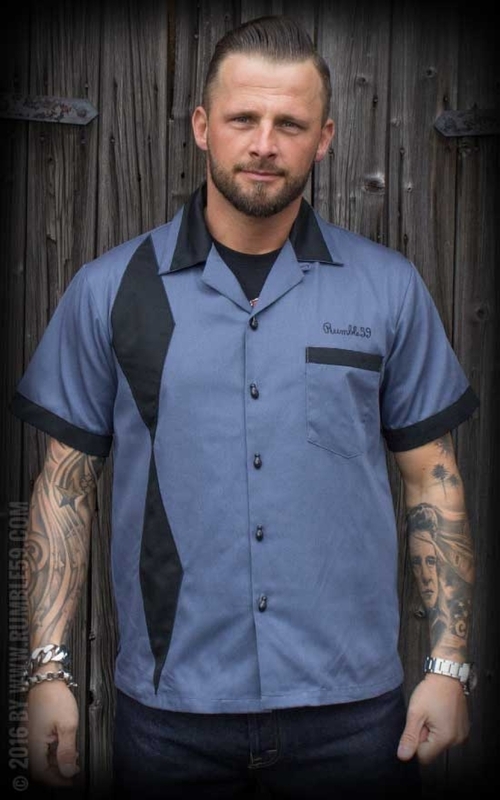 And last, but not least, this shirt is sporting an additional button at the seam. Strike! Patrick is wearing this bowling shirt in size M.
Rumble59 offers a large selection of Rockabilly Shirts for enthusisast of the rock'n'roll style. This bowling shirt with its classic cut and lovely details should be a staple in every rockabilly's wardrobe. Superbe chemise d'excellente qualitée avec laquelle je vais pouvoir allez au Salon SoVintage à Niort (France), à moins que je ne mettre l'autre que j'avais déjà acheté ! !